In our house, we often use the phrase "happy tummy feeling". It describes feeling full, but in a particular kind of way. There's a fullness that comes with eating a plate of french fries, but it's not really a happy fullness. It's more of a heavy, greasy, oh-my-god-why-did-I-do-that fullness, which is the opposite of happy tummy feeling. Happy tummy feeling comes when your tummy is full AND hard at work breaking down all the veggies you just put into it. Dietary fiber is the best way to get happy tummy feeling. Tempeh, sweet potatoes and greens are full of dietary fiber, not to mention vitamins and minerals like magnesium, beta-carotene and potassium. That must be why you can get so much happy tummy feeling from just a small portion of this recipe. That said, I really don't think you should make this recipe because it's healthy. I think you should make it because it's freaking delicious. 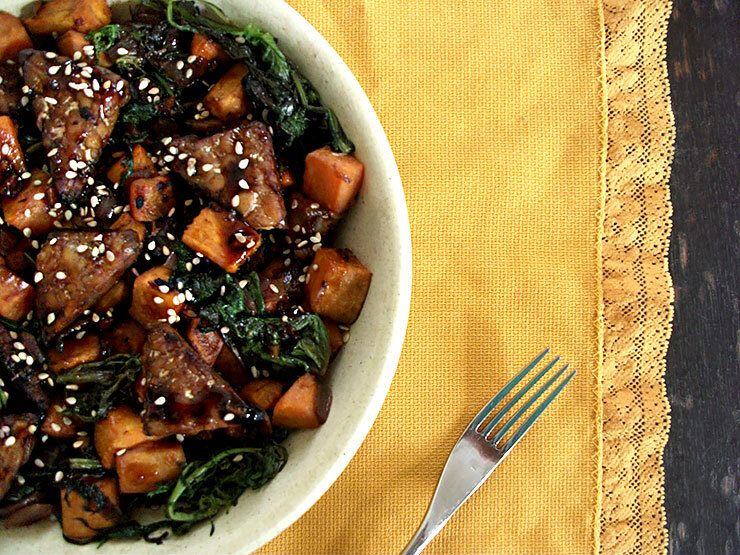 The east-meets-west combination of fragrant toasted sesame oil and tangy balsamic vinegar does wonders for savory tempeh, succulent sweet potatoes and earthy, peppery mustard greens. 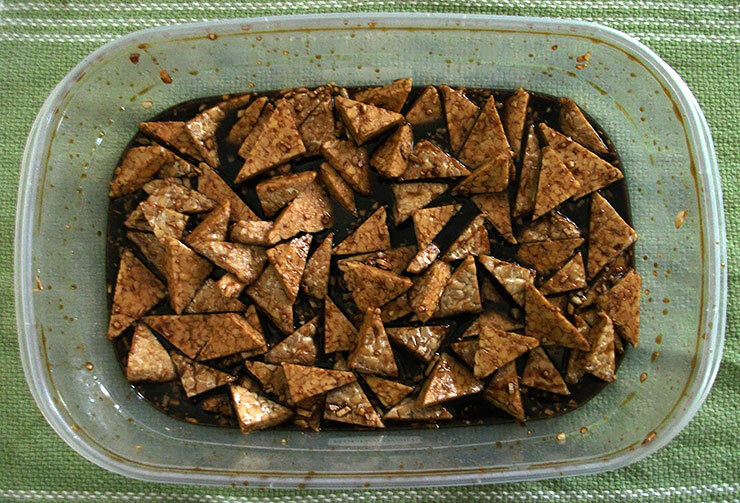 First, the tempeh soaks up a dark, rich marinade that mixes the balsamic/sesame combo with soy sauce, mirin, agave nectar, garlic and ginger. Oh, and don't throw that marinade out once you're ready to use the tempeh. You're going to need it later. 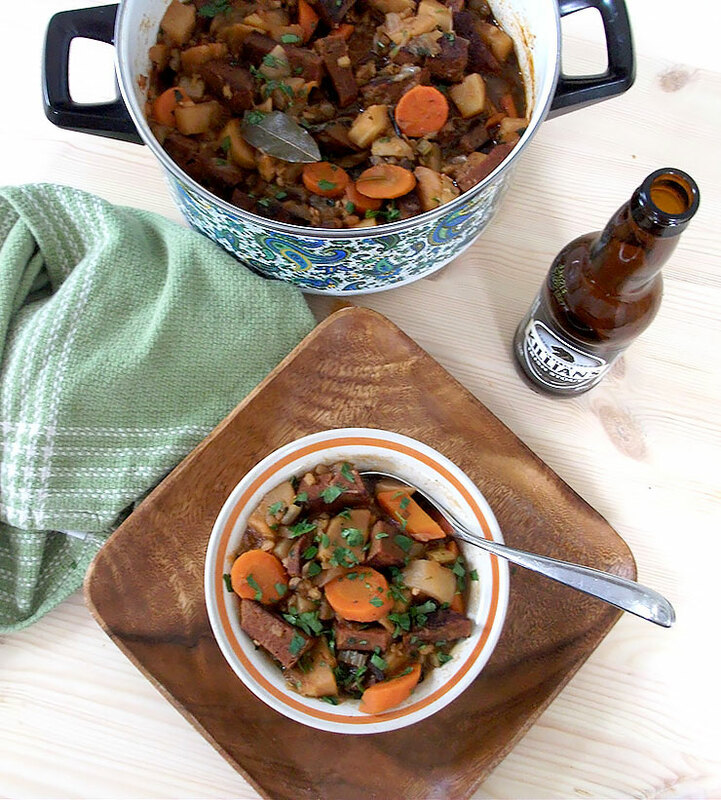 The tempeh is combined with sweet potatoes and they go straight into the oven. Now you want to put that marinade into a little saucepan and boil it down. As it cools, it will thicken into a salty, sweet sauce. While the tempeh and potatoes are roasting in the oven and the sauce is simmering on the stove, you can get started on the third and final element of the dish: the mustard greens. Begin with some balsamic onions. Balsamic onions are just onions that are caramelized in balsamic vinegar. Once the onions are caramelized, throw in the mustard greens a little at a time while sprinkling with water to prevent them from scorching. Mustard greens come in all different varieties with a range of leaf shapes, from broad and flat to curly and feathery and everything in between. If you're lucky, you might find a local grower at a farmer's market who sells multiple varieties in one bunch. Once everything's done cooking, it's time to assemble. 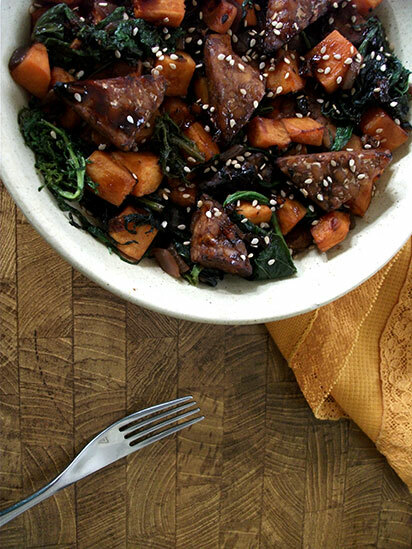 Mix the greens into the tempeh and sweet potatoes, drizzle the sauce on top and sprinkle with sesame seeds. Get ready to make your tummy happy. Important: You'll want to allow yourself enough time to marinate the tempeh. I think it tastes best when marinated for at least 2 hours. Combine sesame oil, soy sauce, balsamic vinegar, mirin, agave nectar, garlic and ginger in a large plastic bag or sealable container. Add tempeh and shake to coat. Marinate in fridge for 2 hours, shaking once. Once tempeh is done marinating, preheat oven to 450 degrees. Combine sweet potatoes, vegetable oil, salt and pepper in a 5-quart nonstick baking dish. Stir so that potatoes are well coated. Using a slotted spoon, remove tempeh from marinade and add it to the sweet potatoes. Set the marinade aside. Bake tempeh and sweet potatoes for 30-35 minutes, stirring every 10 minutes or so, or until potatoes are tender and tempeh is browned around the edges. While potatoes and tempeh are cooking, pour the marinade into a small saucepan over medium heat and bring to a vigorous simmer. Cook 10-15 minutes or until thickened, stirring often. Meanwhile, prepare the mustard greens. Heat vegetable oil in a large pan over medium heat. Add onion and stir in balsamic vinegar. Cook 10 minutes or until very soft. Stir in mustard greens by the handful, sprinkling with a little water each time and allowing them to wilt until all of them will fit in the pan. Stir in salt and cook 2-5 minutes longer or until tender but still bright green. Stir the mustard greens mixture into the tempeh and sweet potatoes. Serve drizzled with the sauce made from the marinade and garnish with sesame seeds.